For anyone who has unsuccessfully tried to properly season an iron pan, a product like the Lodge Logic 12 Inch Pre Seasoned Skillet is a blessing. Cast iron pans are an age-old asset to any kitchen. Its among the most perfect materials for even cooking and high heat cooking. And cooking in iron is actually good for you. Using a pan like this regularly can improve your iron take by 10-20%. Just remember not to prepare high-acid foods like tomatoes in it very often as these react badly to the metal. Compared to having to coat a pan with lard, bake it, drain it, and repeat that process several times before using a normal iron pan  I love the idea of taking the skillet out of the box and cooking! And at $25.00 or less youre going to be hard pressed to find a 12 inch iron skillet thats more durable and value-driven. For campers youll be able to use the Lodge Logic 12 inch pre seasoned skillet on open coals and never worry about damage. It can take the heat and produce a fine meal, be it the fresh fish you just caught, or old fashioned trail biscuits. Even pre-seasoned iron pans require on-going care. Remember to spray some vegetable oil on your new pan before using it, and periodically give it a good refresher seasoning in the oven. When you care for iron this way it often lasts long enough to be passed down the family line. For individuals with hand weakness iron pots and pans are heavy. You may want to test the weight before considering purchasing. Consumers pretty much fell in love with the Lodge Logic 12 inch pre seasoned skillet. The durability, strength of construction and overall functionality all stand out on this product. The price is outstanding especially considering it comes pre-treated. Many buyers use the skillet for searing meat at a high heat. Some people had trouble with food sticking to the bottom of the skillet. This can usually be avoided by making sure to fully heat the pan before adding oil or food. Having said that, iron pans typically need some type of oil or butter if you want to avoid sticking. The final complaint that seems valid is that the handle is rather scrawny for such a hefty iron pan (eight pounds). While I think the handle on this could have been constructed better, I have very little negative to say about Lodge Logic 12 inch Pre Seasoned Skillet. Every kitchen needs at least one good skillet and at the price of this product you could afford two (hey, give one to a friend as a gift). 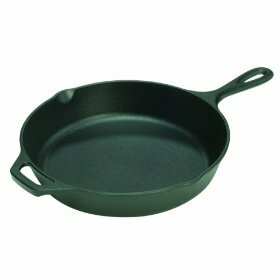 These Lodge Cast Iron Cookware Reviews are written by visitors to cookwaretalk. Read what Lodge cookware users have to say about cooking with cast iron. You can also write a review and share your experience about Lodge cast iron cookware.